Forest Preschool is guided by the idea that children are naturally drawn to nature, need nature to thrive, and learn with enthusiasm and a sense of wonder when they spend ample time in natural spaces. The forest and fields offer an ideal setting for children to learn about themselves, each other, and their place in the natural world. Our program is modeled on the German style Waldkindergarten in which children spend their entire school day outside in rain, shine, or snow, coming inside only in extreme weather. Playing and learning outside in all types of weather allows children to develop self-care skills, confidence, and resilience. Open-ended, unstructured play and discovery in a natural environment supports the development of the whole child and inspires spontaneous, meaningful learning. Lime Hollow Forest Preschool's mission is to provide unstructured time in nature. Our goal is to foster a deep love of nature in the core of young children that they will retain throughout their lives. We believe that making these connections is the first step toward learning about the natural world and becoming a steward of the environment. As all of this is happening, children will be using all of their senses while strengthening their physical bodies. Forest School is a sub division of our Forest Preschool for children 4-6 and is not a private school. 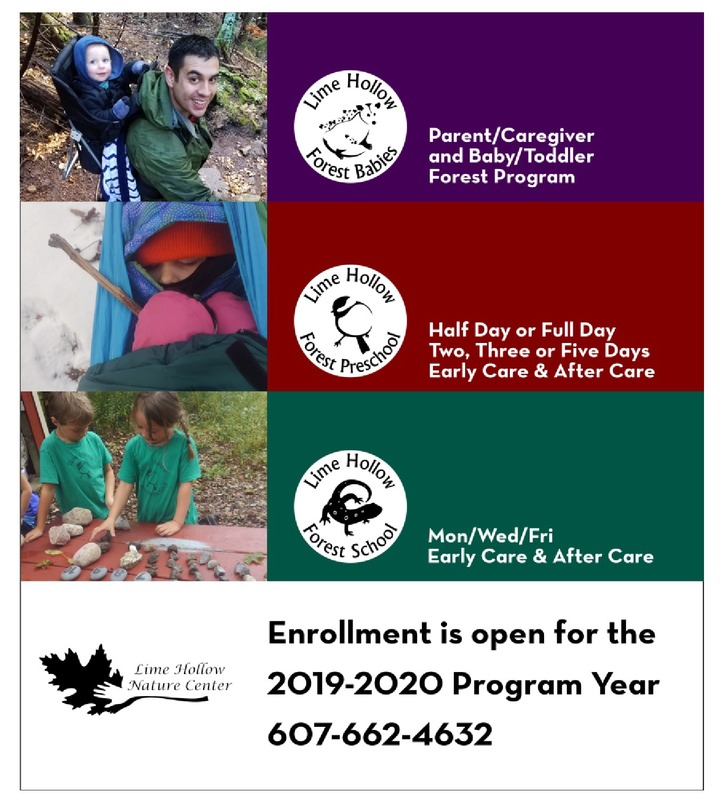 NEW Program Forest Babies- for the Fall of 2019-2020!